Henry George DAVEY was a son of George and Maria Jane (nee FINLAY) DAVEY, of Temuka. His brother Stanley Edward DAVEY was killed in action in 1916 at the Somme, and his brothers Arthur and Francis James DAVEY also served in WWI. 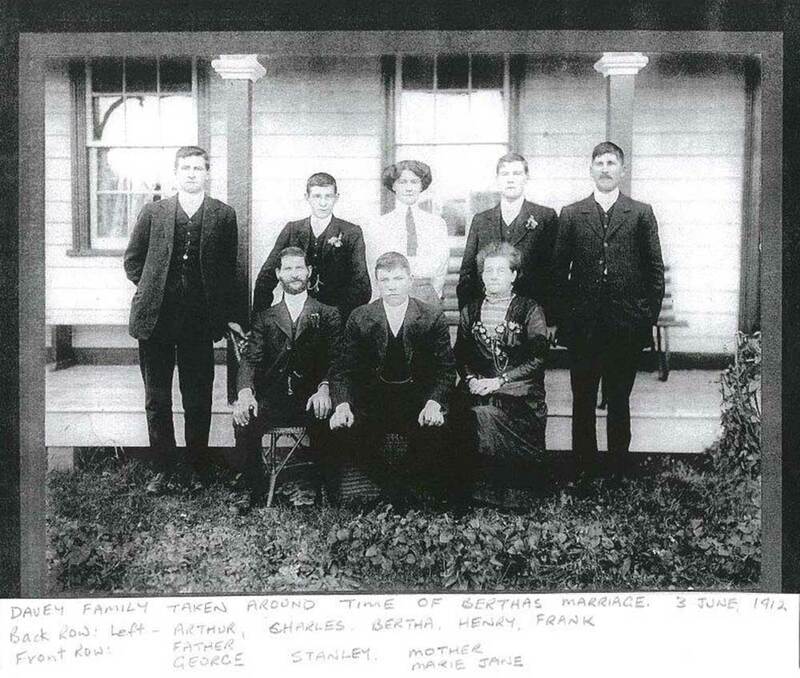 Henry enlisted at Temuka and served in the Ordnance Company in the Home Service as he was unfit for active service. Because of tortuous and bunching veins on his right leg he was unable to stand long marching, and so he was recommended for a stationary position. In addition, he had been rejected for military forces on account of deafness in his right ear.. His military training was at Trentham. He was posted as a Private to H.Q.S. (Musketry Staff) on 24 May 1916. On 18 June 1916 he was promoted to the rank of Sergeant. On 17 May 1917 he was transferred to the Ordnance Department. He was demobilized on 12 December 1918. Afterwards he worked at Trentham making coffins for influenza victims.An irregularity occurred with Henry's service number - he had the same number as another serviceman, which he became aware of in 1964 when the other man's death appeared in the Roll of Honour. While the Ministry of Defence could offer no explanation, any suggestion of confusion was dismissed since all Henry's service was with the Home Service Branch, while the other serviceman served overseas with the NZEF. Henry was granted 'Leave of Absence' in lieu of Discharge. Married Anna Sophia COFFIN in 1919. Daughter.